It took me a while to get all of my information on this particular dog together. I’m am sorry am a little late in answering this question. One the surface, it appears to be one of those old farm bulldogs that are native to the South. One could be forgiven for calling it an American bulldog, but it is very likely that this dog is actually the ancestor of the Johnson and Scott bulldogs. These bulldogs retain much of their ancestral multipurpose utility, a trait they share with many American pit bull an American Staffordshire terriers. The dog above is not an Alapaha blue blood bulldog, although the main center for its breeding and preservation is within the state of Georgia. Although the English bulldog has become rather infamous for its deformed conformation, which makes it–among other things– very difficult to breed. It is also known for being quite hard to train. In fact all bulldog-types have developed a touch of stubbornness. American bulldogs and boxers are notable exceptions. Alapahas are supposed to be a either “a bit stubborn” or very stubborn. However, there is a bulldog with the temperament of an English shepherd. And just like the English shepherd it can be used for herding. The dog in question is officially called a white English bulldog (WEB). It is claimed to be something like the original bulldog, which was a multipurpose farm dog. Just like the English shepherd. According to their preservation society, the original bulldog was a farm dog, not a baiting or fighting animal. One must remember that in England during the Middle Ages and in the Early Modern Period, “mastiffs” were quite common among the populace. It is even possible that our word for dog, which is unique among Germanic languages in that it is not the cognate for “hund,” is derived from the Anglo-Saxon word for a mastiff-type dog (“dogca”). Medieval peasants used their mastiff in much the same way the Swiss used their large tricolored farm dogs. They guarded the home and helped bring in and manage livestock. They also protected this livestock from predators, both human and lupine. Various kings promulgated forest laws that strictly regulated the ownership of mastiffs near the forests, which were useful to the peasant and commoner. Under Canute, all mastiffs owned by commoners had to be hamstrung to keep them from wandering around the forests and hunting the royal game. Henry II changed this law under his forest charter, which required that the mastiffs be expedited. Expedition required that the commoner’s mastiff have three toes on one foot chopped off with a chisel. This procedure would also keep the dog from wandering and hunting red deer and wild boar that were reserved for the nobility and their various hounds. These dogs wold have been useful only as guarding animals, but the animals that were in agricultural areas still would have been left intact. In those days, cattle and other livestock wandered about freely. The Medieval manor had very little fencing, and one of the rights commoners had was access to common lands. These commons were vast areas, and the cattle and hogs wandered about. These two animals, although domesticated, readily go wild without regular human contact. To control these half-wild herds, the Medieval farmer needed a dog that could herd but was also tough enough to put up with cattle and hogs that were quite unwilling to be herded. Some of these mastiffs would actually grip the stock to get them under control. One might remember from the film Old Yeller, in which the big yellow cur dog is forced to body slam a free range dairy cow so that she and her calf can be brought in. It is very likely that these farm mastiffs would have had to do this behavior. Cattle were generally not eaten during the Middle Ages, simply because they had so much utility as milk and draft animals. However, as feudalism began to transform into early mercantilist capitalism, a modest demand for beef began to develop. This demand for beef would skyrocket with the Industrial Revolution, which made draft oxen nearly obsolete, and generate an even larger market for beef. But in those early years of the beef industry in England, the cattle were still free range, which means hat their meat was quite tough. Further, the meat animals in those days were typically those cattle who were no longer productive as draft animals or milkers. So the meat needed to be tenderized. Knowing that some of the farm mastiffs would grip a bull or cow, the butchers of that era began to use the dogs as meat tenderizers. We would consider this practice quite in humane slaughter today, but the butchers would let some mastiffs fight a bovine until its flesh became tender and flavored with lactic acid. Annie Dillard saw a similar tenderizing technique used on a captured deer in Ecuador. The natives tied the deer to a tree and then beat it every little bit, just so that its flesh would be more palatable when they slaughtered it. The butchers began to breed their own strains of mastiff for this purpose, and these dogs became known as “Alaunt de Boucherie.” The white mastiff of Medieval England was always called an “Alaunt.” These dogs, according some fairly decent historiography and some legend, came to Western Europe via the Alani people. These were an Iranian people, closely related to the modern Ossetians, who originally lived in the Caucasus. They migrated West into Europe, eventually reaching Gaul in the early 400’s. They supposedly brought with them white mastiff-type dogs that were used for war, guarding and controlling livestock, hunting, and hauling loads. These dogs made it to England and Spain, where they founded the aforementioned white mastiffs and the Spanish alano dogs, which were also used for herding. The white mastiff continued on as the commoner’s farm dog. 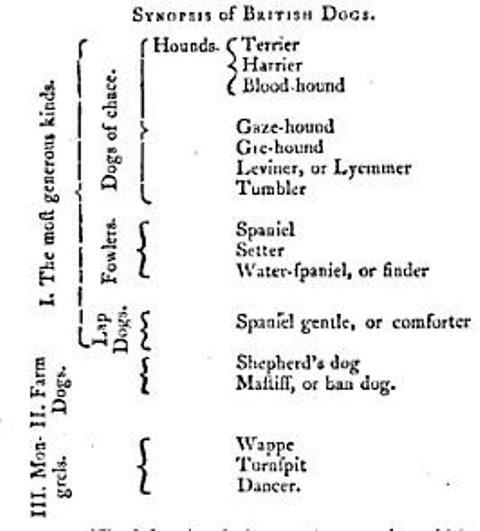 Many English colonists to the New World brought these dogs with them. One of the two dogs brought on the Mayflower was a mastiff. Richard Whitbourne and William Wood extolled the virtues of this mastiff in the New World, for they very easily can subdue the North American wolf. Whitbourne would also describe his own mastiff running for days with a pack of Newfoundland wolves, which shows that at least some of these mastiffs were very docile with other dogs. These mastiffs continued on as farm dogs, although they were becoming distinct from the butcher’s dog, which was also being transformed into a baiting animal. Bull and bear baiting became popular activities in the seventeenth, eighteenth, and early nineteenth centuries. Whole strains of bulldog developed for this purpose. These events were competitive events that used the butcher’s bulldog. Think of them as something like a working trial for a butcher’s bulldog. These events were popular until 1835, when they were banned by the Cruelty to Animals Act. As we know from other types of working trial, trials change dogs, and such was the case with the baiting-bred bulldog. They were bred for even stronger prey drive and for even higher pain tolerance. The tractability that had so characterized the white farmer’s mastiff went out the door. At the same time England, the Enclosure movement radically changed the countryside. The smaller allotments that had once characterized English farms gave way to huge estates. Millions of agricultural workers were streaming into the burgeoning industrial cities to find work in the factories. The landed gentry– many of them nouveau riche– began buying up vast tracts of land, first to raise vast flocks of sheep and then to set up shooting estates. Walls and fences sprung up throughout the countryside, and the various dogs that comprise the greater collie landrance came to fore. But the popularity of baiting soon took over what was left of the bulldog in England. The other English mastiff breed, the one we call the mastiff today, began to develop as an estate guardian dog. It could have possibly consumed some of these white mastiffs, and one breed of estate guarding mastiff, the bullmastiff, has definite “bulldog” ancestors. This other mastiff was primarily based upon a line developed at Lyme Hall in Cheshire. Supposedly, one of the mastiffs from Lyme Hall guarded his wounded master at Agincourt. This master was Sir Peers Legh II, and his family residence was Lyme Hall. Legh died from his wounds, bu the mastiff supposedly returned home to Cheshire, and from this dog, the whold Lyme Hall mastiff strain was developed. These dogs were not the same breed as the white mastiff, but because so many old resources are very loose with what we are referred to as mastiffs, mastiff and bulldog history winds up a bit intertwined. Suffice it to say, the white farmer’s mastiff was much more common in England than the the estate guarding and war mastiff. They probably were related, but the white mastiff was from the Alaunt landrace and the other mastiff from the Molossus complex. As estates needed dogs to assist the gamekeepers in controlling poachers, the remnant white mastiff in England melded into this population. More controversially, it also likely melded into the sheep dogs. Have you ever seen an English shepherd with a blocky head and heavy bone? Many English shepherds I’ve seen of this type tend to take guarding much more seriously than others. They also tend to be larger in size. Although English shepherds are traditionally regarded as an American breed, they were derived from various English farm and sheepdogs. Dogs of this type could still be found in Northern England as recently as 1901. These dogs are different from the Scottish shepherd’s dog or the collies that were developed in England. They were said to resemble either a setter or a Newfoundland dog and were found throughout the south of England. Traditional sources claim that the mastiff features that appear in some of these sheepdogs were the result of Roman cattle dogs, but there are some accounts that suggest that these sheepdogs were the result of breeding the proto-collie-type with a mastiff. In this case, mastiff would mean the herding white mastiff, the ancestral bulldog. Quite a number of writers on the collie have quoted from Caius’s description of the “shepherd’s dogge” in treating of the rough collie, but he did not write of that dog at all, but the light mastiff or bandog, which was used as a sheep dog. If we recognise that mastiff meant simply mongrel or common dog, and that it included pretty nearly everything outside of hounds, spaniels and terriers, and not a specified breed such as we know mastiffs, we will the more readily understand what produced the English sheep dog, and that, as we have already said, he is not a collie proper, though now known in England as the smooth collie. As Caius wrote only of the smooth dog, he will be quoted in the chapter on that breed. As we shall show when it comes to discussing the smooth dog, the latter was developed from the common English dog of the farm, the small mastiff that went by the name of bandog because he was the dog that was kept on a band or collar and chain—a watch dog, in fact (pg. 346). Watson’s biases are showing here, because he fails to recognize the herding mastiff as a landrace that bred true among the commoners’ herds and flocks, but it still points to a relationship between the collie-type dog of England and the herding mastiff. The Drover’s Dog is very often a cross between the shepherd’s dog [the collie-type] and the mastiff, the foxhound, the pointer, or the grayhound. It displays many of the best qualities of the shepherd’s dog, and if too frequently very different from it in its cruel treatment of sheep, the fault is originally that of the brutal master. This breed [The English sheep-dog or Southern sheep-dog] seems to have originated in a cross of the colley with the mastiff. While the former is the Scottish and Welsh sheep-dog, the present animal is the original or true English one, although the colley is now in general use on the extensive downs of Wiltshire, and in some other parts of this country. Our old English authors term it the shepherd’s mastiff; and this perhaps will account for some modern writers having improperly termed it the ban-dog, whereas that name belongs to the true English mastiff alone (pg. 148-149). Although many collie and English shepherd historians suggest that the Molosser features in many strains of English shepherd are because of Roman cattle dogs, it seems much more logical to consider that these features actually came from the shepherd’s mastiff, the ancestral bulldog. It is unlikely that the majority of English shepherds living today have a high amount of bulldog blood– none are true smooth-coats– but it is possible that the last remaining shepherd’s mastiffs were part of the early English shepherd’s ancestry. If this possibility is true, then the shepherd’s mastiff was absorbed into three different types of dog: Some were bred into the old war mastiff-type to make a better estate guardian. The majority evolved into the baiting bulldog. 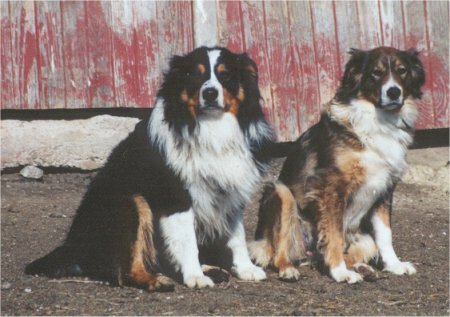 And a few were absorbed into some of the English collie-type landrace, which later became prominent in the North American countryside as a working farm dog. The baiting bulldog would eventually evolve into the modern pet bulldog breeds. After bull-baiting was banned, the dogs were bred to be fashionable pets. One man instrumental in this effort was Bill George, a dog dealer who produced many different strains of pet bulldog from the former baiting stock. However, the fortune of the shepherd’s mastiff was much better in North America. As I mentioned earlier, mastiffs were ubiquitous in the English colonies. They were used as they were in England, as guardians and stock dogs. They were also used to hunt wolves and to do some modest hauling work. These were common dogs in the colonies and on the frontier, especially in the South, where a vast subtropical wilderness proved to be the ideal place to run vast herds of hogs and cattle. The white shepherd’s mastiff would have been ideal for those conditions, for they strongly resembled the open field system that existed in feudal England. Later, as the slavery-based agrarian economy spread through the South, the white mastiff was able to live in a society that was very similar to that of feudal England. Although most of us are aware of the social constructs (and absolute evil) that was slavery, the South’s demographics also included a substantial number of yeoman farmers. It was on these farmers that Jefferson envisioned his ideal republic: small farmers living sufficiently in rural settlements. As the shepherd’s mastiff had been the ideal farm dog for commoners in England, it would prove to be the ideal farm dog for the small Southern farmer. The White English Bulldog Preservation Society claims that the dogs the Southern colonists and farmers used were derived from the Spanish alano, which is another herding mastiff. Although it is very likely that Spanish had alanos tending their herds in Florida, it makes more sense that these dogs were of English origin. The Spanish did settle in Florida and other parts of the South, but their influence was nothing compared to the vast onslaught of English settlers, many of whom were escaping religious or political persecution in the old country. The Spanish may have been in the South longer than the English were, but they did not settle as extensively as the English did. If alanos made up these working farm mastiff, they were probably very small in number compared to the English shepherd’s mastiff. The mastiff was a very common dog in the English colonies and in the early days of the United States. However, the Industrial Revolution took hold in the North, the mastiffs, curs, shepherds, and hounds that were developed in that region nearly disappeared. People no longer lived on the land, and because of the wealth that was created through industrial production, the majority of people were able to buy imported European breeds. The South did not experience the full brunt of the Industrial Revolution until after the Civil War. It remained an agrarian, quasi-feudal society well into the twentieth century. Because of this “stunted development” (part of which was actually caused by the war and Reconstruction), the South was able to retain many of its traditional breeds. Including the white shepherd’s mastiff. Americans preferred to call this dog a bulldog. They were similar to the bulldog of England, even though they were used for a very different purpose. These bulldogs were general farm dogs– just like the English shepherd and the blackmouth cur. This type of bulldog was very common in parts of the South. It was entirely unlike the show bulldog that was developing. It was a biddable animal, taking direction where ever it was given. It was gentle with children– even those who try to cut its ears with scissors– and with other animals. It was aggressive towards people or other dogs only when it or its family were attacked. Although it was known there were differences between this dog and the show bulldog, no one knew which came first– or cared. It was only when efforts to preserve the Alapaha blue blood bulldog came to the fore that it was realized that there was another distinct strain bulldog type in the South. From this realization came the White English Bulldog Preservation Society in 2006. And through the society’s research that they realized that the white English bulldog was actually the original bulldog-type. Much of their research comes from the work of Col. David Hancock, perhaps the greatest living dog historian. The old white shepherd’s mastiff may have disappeared in England, but its descendants continue to live on in North America. This dog may be a vestigial remnant of what was once the empire of the herding mastiff, but because it is preserved, we can fully understand the real story of the bulldog. It began as a rugged multipurpose farm dog– and now it can’t even mate without human intervention. A special thanks is in order for Andy Ward of Old Time Farm Shepherd for helping me do some research for this post. And another special thinks to Terra Presotto for providing me with more information on WEB and for letting me use her photos of her WEB in this post. Uga VIII dies of lymphoma at 17 months old. And Georgia could easily get a WEB or Alapaha that will easily outlive one of those deformed dogs. we’ll have to agree to disagree on this one. As you noted in one of your other posts, “backcrossing” can yield a conformation appearance within very few generations, so the “look” of English Setters to “American bulldogs/ farm bulldogs” is not really proof of any recent relationship. The DNA evidence indicates that dogs like the Belgians and collies are more related to the sight hounds than dogs like the mastiff. Dogs like the GSD do show relationship to a mastiff type – most likely not the English mastiff, but those dogs that were to be found as “mastiff types” and “guardian types”. This isn’t to say bulldogs have no relationship to herding dogs. In the past, dogs were pretty much on a spectrum if they weren’t exclusively “hounds” or “lap dogs” owned by the aristocracy. So a Roman draft / cow dog was also used as a guard for the cattle and variations on the theme are indeed found in Switzerland, Belgium, and the UK – the coat type varying as needed for the various environments. And certainly cow dogs were crossed to sheep dogs. 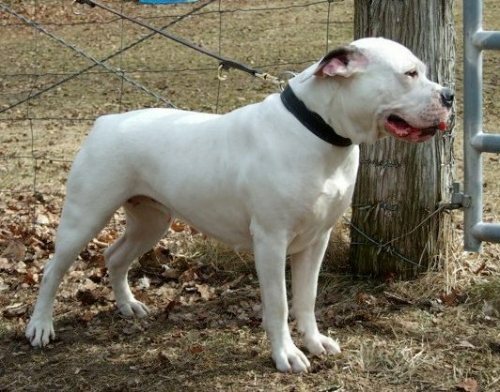 The “butcher’s dog” was a variant developed from the cow dog – hence imo, bulldogs came FROM the herding dogs (which were then crossed into more “pit” and mastiff types) rather than the other way around. Dogs used to “catch” wild or feral animals are at a far extreme of the herding spectrum and yes, they are the most “bull dog” / “catch dog” types. The Catahoula is most likely from an original base of Beauceron crossed to hounds and catch dogs – the one for the “voice” and the other for the grip that was needed for feral cattle or pigs (neither of which exist in any large numbers in France). Actually, there may be evidence of them, but as far as I can tell, only one that was ever adopted were the Iberian dogs behind the Australian shepherd, which is why they have different genetics from other collies. If there are any Spanish genetics in American dogs, it will be in the Navajo and Apache livestock guardian dogs and these would be in the smaller size mongrels (which might have a Pyr or Mastin as an ancestor). Mark Derr explains what happened to the Spanish dogs in North America. Anglo-Saxons didn’t use them or understand them. We Northern Europeans are active herding dog people. I am skeptical about the Catahoula. I think they are more likely derived from true curs. If they are Beauceron-derived, why are there no black and tan ones? Further, have you seen the long-haired ones? They look very much like English shepherds. The only traits that suggest proto-Beauceron ancestor are the merle coat and the double dewclaws. I did say that the bulldogs came from the herding dogs. 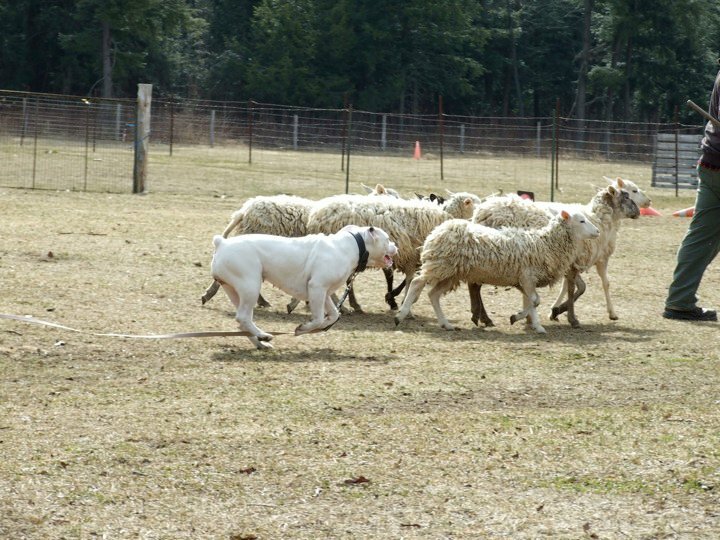 It was the white herding mastiff. Anyway, the Alani people did not have collies or shepherds. They had mastiffs– and maybe heavy greyhounds. The mastiff- type is much older than any active herding dog. Some of the earliest domestic dog remains were dogs with mastiff features– and these date to the 14,000 year-old-range. The Spanish did settle what became the US, but their settlements were not as extensive as the English. And the Anglo-Saxons and Spanish cultures are not mutually exchangeable. The only evidence I’ve seen of Spanish domestic animals surviving in the New World are the mustangs in New Mexico that have ancestry from the Spanish barb. It’s likely Australian shepherds– at least some strains– have Spanish ancestry. But the rest, well, it’s dubious. Supposedly the mule-footed hogs of Arkansas and Missouri come from hogs that De Soto’s expedition herded up here, but again, not a single genetic study backs this up. BTW, ES evolved mostly in the Eastern US, not the West. The British Isles were a great place to create an agriculture society, since that part of the Europe experienced very long, and very peacefully periods. So also, the mastiff – type of dogs were not needed in wars but in other usages. you asked: I am skeptical about the Catahoula. I think they are more likely derived from true curs. If they are Beauceron-derived, why are there no black and tan ones? Further, have you seen the long-haired ones? They look very much like English shepherds. The only traits that suggest proto-Beauceron ancestor are the merle coat and the double dewclaws. == For one thing, there ARE “atat” catahoulas. Many may have tricolor (white added), but they do come in the “black & tan”. See Wikapedia, or do a google image search. Black with tan markings is recognized as an acceptable color in the existing standard. The original dogs were more briard coated than the modern Beauceron type coat. The harlequin (not just merle) gene is very restrictive. Beacerons, Danes and Catahoulas. In catahoula, the “harlequin” is sometimes called “patchwork”. I’m skeptical of them having Chien des Plain in them. That’s the proto-Briard and Beauceron. I seriously doubt that anyone in the South would have kept a dog with a coat like Briard for any reason. The only coats that exist in Catahoulas are variations of the smooth coat and the feathered collie coat. The distinction of catahoula is just something recent, too, because historically they were interbred with yellow curs. They don’t just come in merle. I am very aware of this. However, the dogs I’ve seen point to them actually being just a variant of the more common blackmouth and cracker curs than something so unique that it points to Spanish or French origin. If it’s a Spanish dog then it’s a Carea Leones. Americans had no use for the livestock guardian dogs until the past few decades. The historical record on this is clear. Only Native Americans adopted these dogs, but the big mastiff-types essentially disappeared into the various dogs they preferred to have. If there are any dogs of true Spanish origin that are indigenous livestock guardians, it will be with Navajo and Apache dogs– which look like generic mongrels. Great article i have a White English bulldog who just 2 months ago went through a herding instinc test at 8 months old showed real promise for utility work that i will start to train in the fall.Also i would like to add that this boy can track i started tracking with him at 6 months of age and by the end of his first day could find a person hiding in the grass at 200 yards away.In short he may not be the best dog in all sports (far from the worst)but he can do them all i have not owned alot of dog’s in my life but this boy is by far the most universal dog i have seen.Thank you for the article. Very nice article. I enjoyed it very much. While the Spanish were indeed the first major importers and livestock, including dogs to work said livestock. It is also known that the Spanish were the first to import the English Shepherds Mastiff type to the New World. There is unmistakable variation in type between the Old White English stock, some showing a Spanish Alano ancestry while others show a very definitive English and French ancestry. Of interest is your mention of the smaller mastiff/bandog of England kept tied, as this describes what is commonly known in the south as the Brindle Bulldog. Officially, the Preservation Society no longer refers to these white sheperds mastiff as ‘bulldogs’, (for reasons you’ve already explained), but now are simply called Old White English. We at the Preservation Society are thankful for your interest and such a well researched and written article. On a side note, the ABBB was developed by using the OWE as a foundation during the mid 1980’s. It was not however, the ABBB that spurred my interest in the OWE and their preservation, but rather my memories and knowledge of my great-grandfather’s OWE on his farm. Please visit our new simplified website with our latest research. Indeed, while we at the Preservation Society are dedicated to preserving the funtional usage of White English as the Shepherd’s Mastiff, one must not overlook its relation to the Cuban Mastiff used to guard cattle. the White English are found mainly in their puriest form, (as a Shepherd’s Mastiff) along the old Desoto trail, where Spain established a number of forts. Cuba was the main supplier of these forts. The Cuban Mastiff was documented by English Mastiff historians as most closely resembling the 16th century English Mastiff. Why don't dogs re-evolve into wolves when they are left to breed freely?